Delicious recipes. Favorites include P. 92 Stuffed Pepper Stew and P. 124 Mini Vegetable Lasagna. A practical cookbook for people with diabetes. You're cooking for just one or two. You're short on time and energy. You're tired of using family-sized recipes, wasting ingredients, and eating leftovers day after day. You want a cookbook you can rely on for great-tasting, easy-to-prepare recipes, without a lot of fuss. 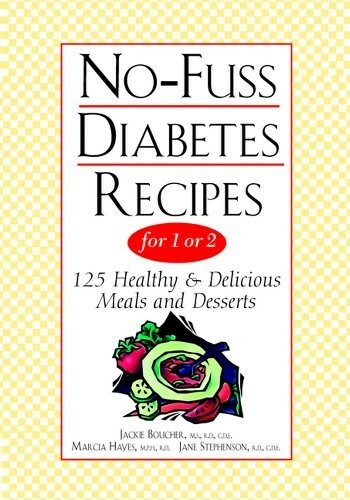 The innovative No-Fuss Diabetes Recipes for 1 or 2 serves up 125 delicious recipes in large print--most of which make one or two servings, use ten ingredients or less, and are simple to prepare. You'll enjoy sumptuous breakfasts, lunches, dinners, and desserts, including Gingerbread Pancakes, Grilled Turkey Breasts with Corn Salsa, Salmon Caesar Salad, Peppercorn Crusted Sirloin Steak, Vegetarian Taco Salads, Spinach and Feta Calzones, Pan-Seared Rosemary Lemon Chicken, and Cranberry-Apple Crisp. Each recipe features nutritional information, including carbohydrate choices. The authors also provide great menu ideas, shopping tips, and advice on how to stock your pantry.